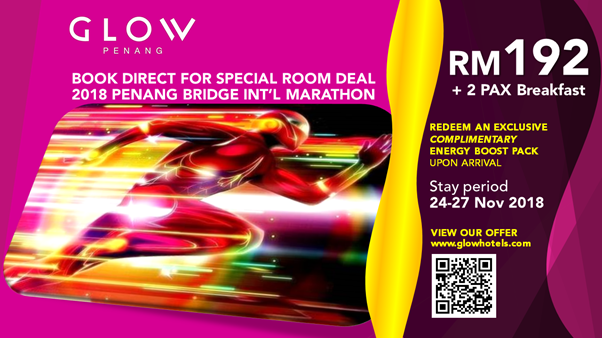 In conjunction with Penang Bridge International Marathon (PBIM) to be held on 25 November 2018, GLOW Penang is pleased to share the latest Special Room Deal Package for PBIM 2018 runners. Welcome runners ! Enjoy an unforgettable weekend moment with GLOW Penang. Not only offering room with breakfast but also given out one pack of Energy Boost Up drinks when stay with GLOW. Live Life in Full Colour. Just GLOW! Do not hesitate to call the GLOWing number for further assistance: +604-226 0084.